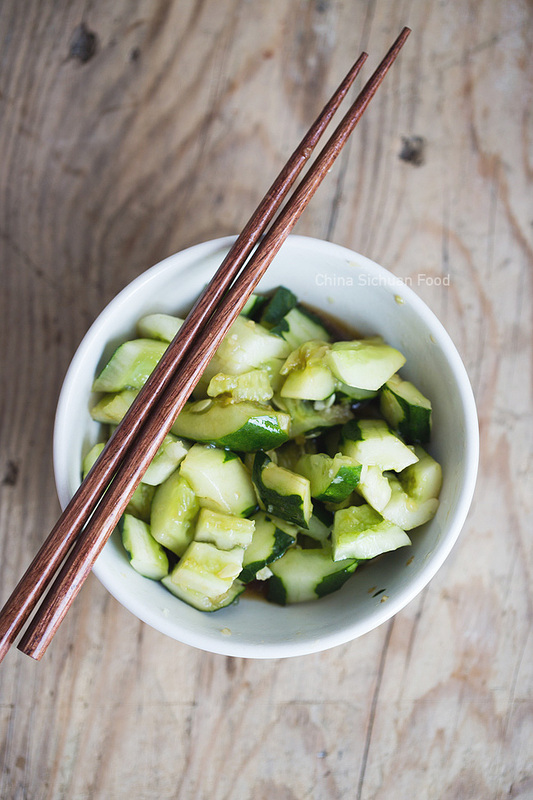 Chinese smashed cucumber salad with garlic, vinegar and sesame oil. 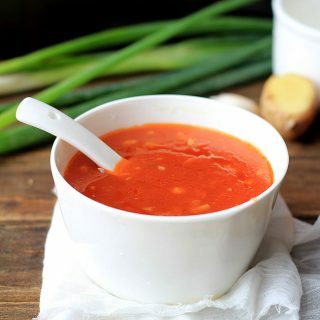 This is one of the most popular homemade cold dishes in China, which only requires 5 minutes from preparation to table. 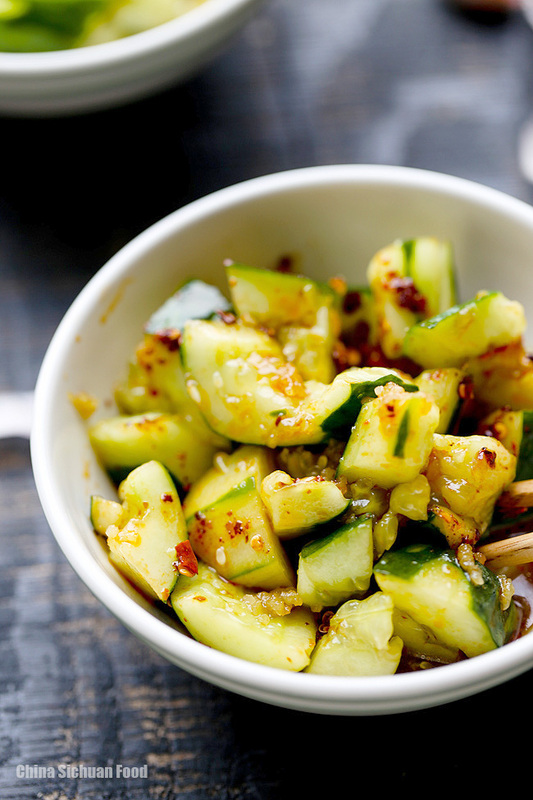 Cucumber is really great for summer. 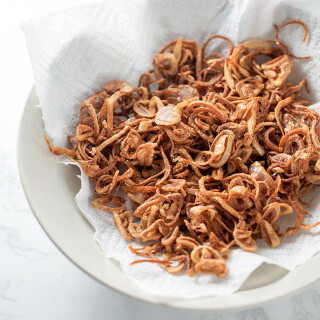 The cool and crispy taste can help us against the hot weather. 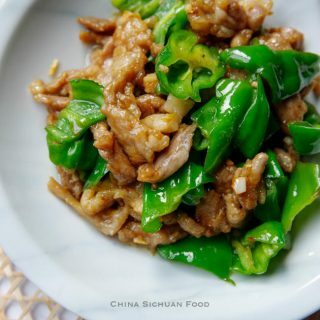 There are many cold dishes in China which equals to salad in western centuries for example Chinese cabbage salad, cucumber salads, spicy chickens salad. 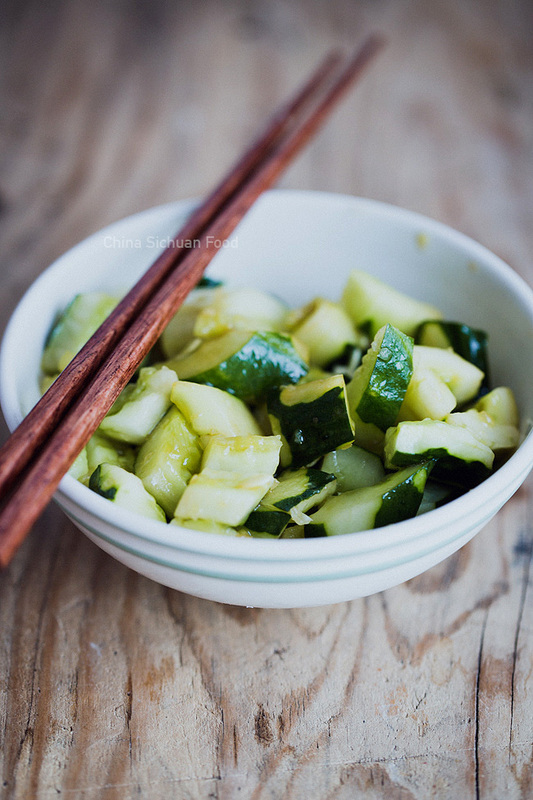 Usually Elaine has two ways of making easy Chinese cucumber salad: one is to smash it directly before mixing and the other one is to pickle the cucumber slices for 1 or 2 hours. Smashed cucumber can absorb more sauce within the cucumber, as a result, having a compound and uniform taste. 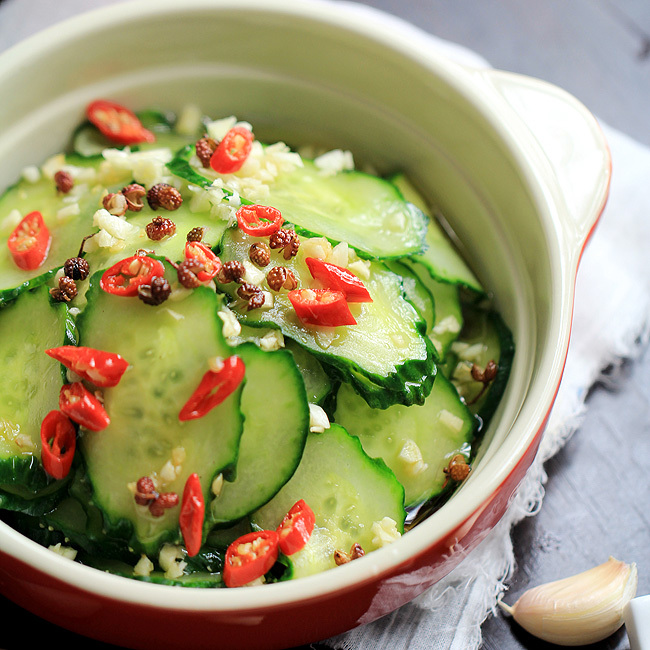 However pickled cucumber salad has two layers of taste. The first is the combined sauce, succeeded with a crispy and freshness from the cucumber slices. I strong recommend you trying both ways if you love cucumber salad the same as me. 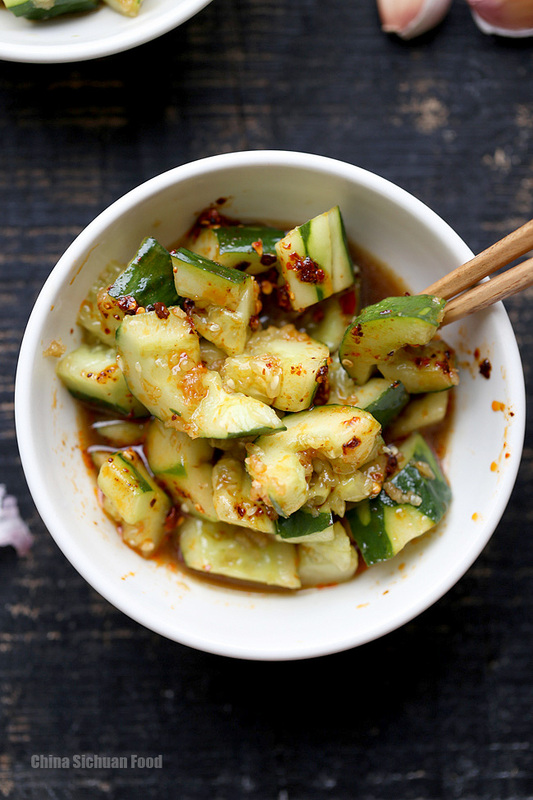 Following is the photo of spicy pickled cucumber salad. For the cucumber, pick fresh ones and just peel the think skin off and remain some thin skins, which can help to add some extra green color and also make the smashed cucumber crisper. If you really do not like the skin, you can peel them all off. Do remember to cut the two ends off. 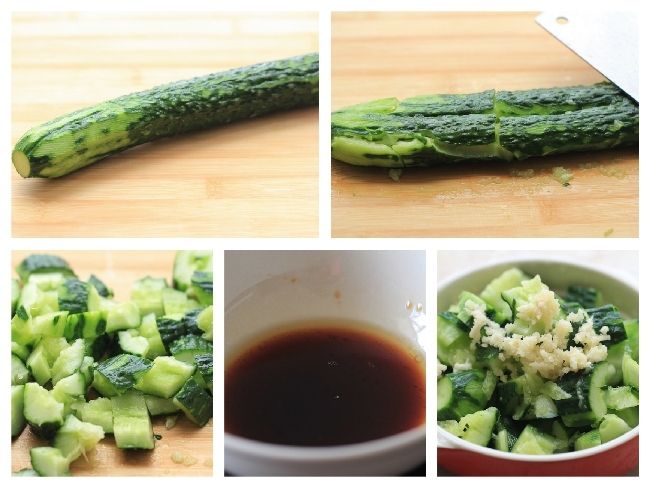 Smash the cucumber and then cut into small pieces casually. And then marinate with the sauce. 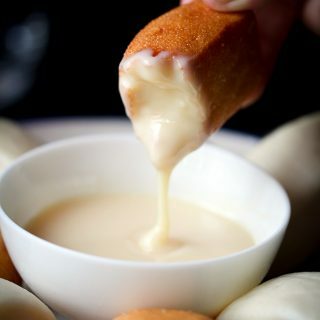 The garlic sauce I introduced today is the most basic and mild version. For a spicy version, you can add some chili oil or add some chopped fresh thai chili peppers. wood ear mushroom salad–the spicy and sour version I love the most. Wash the cucumber and peel off tough skins. Remove the two ends and smash with a wide kitchen knife (like Chinese slicing knife) until the cucumber is well crushed. Then cut into one bite pieces. Transfer all cucumber cubes into a bowl. Mix well with mashed garlic and other sauces. For very tender and young cucumber, you can keep most of the skins. Summer is not easy and wish everyone happy cooking! That’s a really interesting technique-crushing the cucumber. I will have to give it a try. Thanks for stopping by and commenting. Hope you like it. Great recipe. I used the smashed cucumber method and it turned out great. 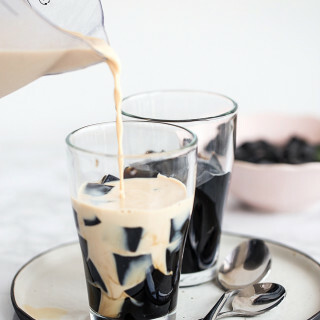 So easy and simple to make. It took me about 3 minutes start to finish plus the 15 minutes in the fridge. The salt released a decent amount of water from the cucumber during the fridge time and that, mixed with vinegar and seseme oil, made a nice, light and fresh dressing for the salad. I’ve had this dish in many places in China but this was one of my favorites so far – fresh makes everything better. Thanks Zhou for your feedback. This is one of my favorite in summer days. I like the cool version with some water released. Glad to know that you like it too. we love a salad we have had often in china that has tmoatoes, smashed cucumbers, garlic, ginger, black vinegar, shoyu, sesame oil, sesame seeds, chili, etc. i sounds kind of like fah huang gua. how should it be spelled? thanks so much! Is it Da Ban Cai? Where do you had this dish? I mean which province or what type of restaurants? Thanks Jenni for leaving me this note. 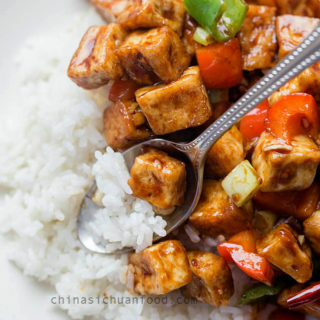 Home-made Chinese dishes usually provide wonderful tastes. That’s a really wonderful idea to make them at home rather than resort to canned food. And you picked two challenging recipes. Good luck and happy cooking ahead. 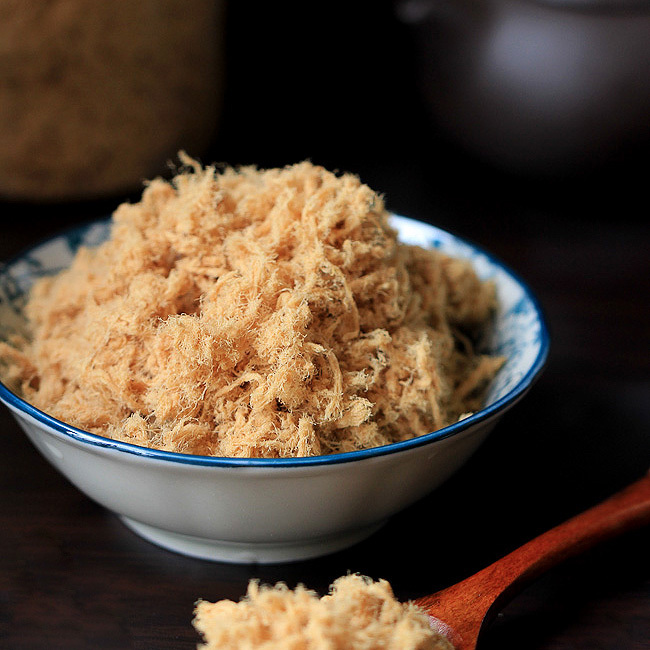 When I lived in Hebei, I asked my friends to teach me to make this. Your recipe is very similar to theirs except for one thing: After they cut the cucumber, they mix it with some salt and let it sit for about 15 minutes. Then they squeeze some of the liquid out of the cucumbers and get rid of the extra liquid. It helps the cucumbers absorb the sauce. BTW, your pork belly recipe was amazing and I used it to make a Thai dish with Crispy Pork Belly and Chinese Broccoli! That’s also a popular method. You can use both ways. Personally for this smashed cucumber, I just mix seasonings directly without squeezing the water out because it is smashed already. Smashing is used for the purpose of better absorbing of the sauce. And thanks for your feedback. I LOVE crispy pork belly too. Happy cooking and enjoy! What an mess! In fact, I do not know the exact name of this cucumber too. It is not native in China. I used to splatter on the operating board of my kitchen and the walls but then I tried to use a large Chinese style slicing knife, which is really wide. So it really helps a lot! OK, I’ve got one of those knives hidden in a kitchen drawer. Now I know what to use it for! It is really yummy and easy to make. I serve it a lot as a side dish for summer. Could you tell me the calories for this? Sorry I did not figure out the calories for this recipe. Regular or Toasted sesame oil? OMG this is full-on *amazing*. 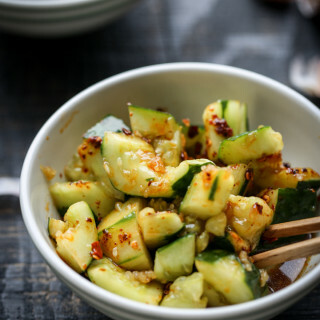 I had a cucumber salad like this in an amazing Chinese restaurant, and have been trying for years to get the sauce right. This is it! I added cashew nuts to it, because that’s how the restaurant did it, and it makes this salad a light meal for me. 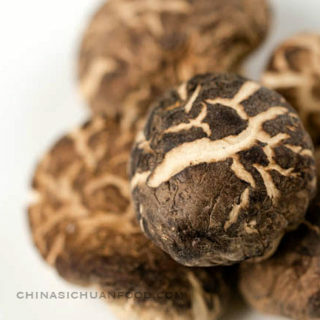 One question–in China do you use fresh new garlic, or older garlic? The reason I asked is that the Americans eating this thought the garlic was too strong. I like it strong, but when cooking this for others I’ll need to leave the garlic out and let people put it in themselves. I’m wondering if maybe in China you are using a milder form of garlic than what we usually have here? Thanks again, Elaine, for all your awesome recipes. We use older garlic. And they have strong tastes too. After harvested, we hang the garlic so they can be dried by air. After the process, the taste becomes quite strong. 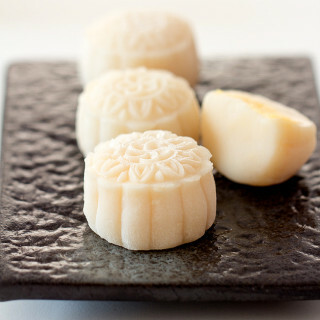 This dish is one of my favourites from when I was living in Beijing. Thank you! However I am a common Dutchman I like Chinese food and especially the authentic Sichuan kitchen. I do not eat meat very often but sometimes the pictures and recipes are mouthwatering and I cannot resist to cook it. In the comments for smashed cucumber salad I read about coocked sesame oil. 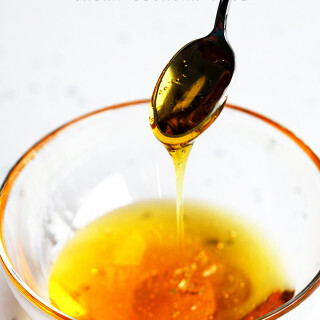 What is the difference between cold pressed oil and coocked oil and how can i make it? Or is is not really nessesary? In Holland Lee Kum Kee sesame oil is easy to buy but I think it is a cold pressed oil and has a rich flavor. I am curious to your reply. Cold pressed sesame oil actually contains more nutrient substances with rich flavor of course. However toasted sesame seeds has a unique aroma brought by the heating process. You can smell it from toasted sesame seeds. So most Chinese kitchen use toasted sesame oil. this is really a quick, easy and tasty side dish. I really love the combination of the black vinegar and sesame oil in the dressing.